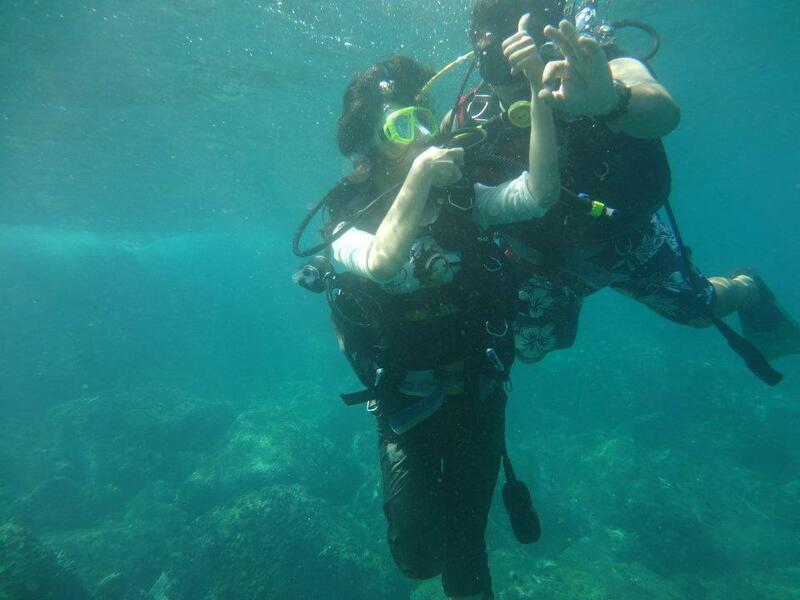 I stood in the boat, sullen and anxious, while the instructor helped me into the SCUBA Gear. Sullen, because I was seasick, and anxious because I had never as much as dived in a swimming pool. 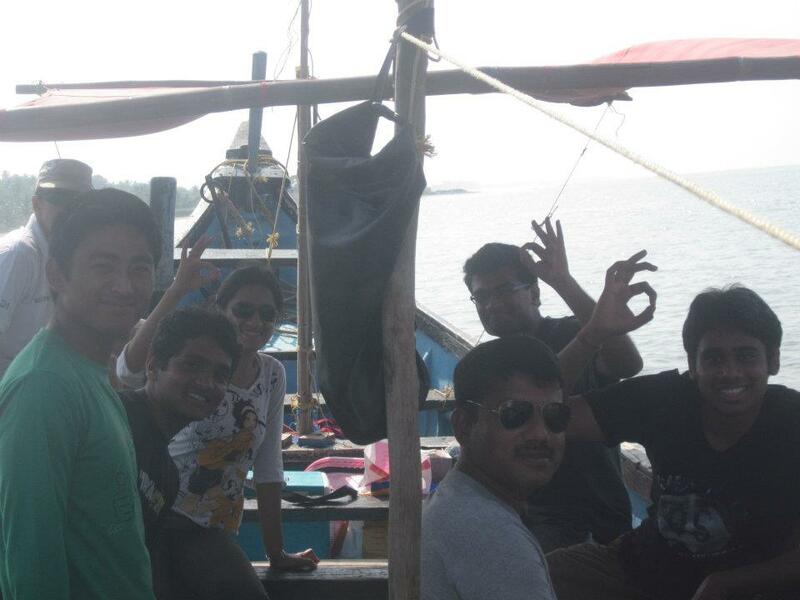 But I had chosen to come for the SCUBA Diving experience at Netrani Islands near Murudeshwar, and that involved diving very much into the Sea. I have a little problem – I cannot say ‘I am scared’. Whatever it is, I have to give it a try. So when Kartik, KG and Prarabdh asked me if I would like to come to Netrani, I had to say yes. Now they were all already in the sea water, splashing around like the three happiest kids on earth, while I readied myself for the impending disaster. It was hot, I was hungry, the lifejacket was too tight, the fins were making everything so awkward, and the mouthpiece – oh I hated the mouthpiece! How many people had put it in their mouth anyways? And of course, the oxygen cylinder was heavy, and they had put extra weight beneath the life jacket. I didn’t really belong in the air with all that gear. Sooner or later, I had to jump in. So when the instructor told me to jump in, I jumped in. Not exactly though – first I swallowed, then I swallowed again, only to realise that I had nothing more left in my mouth ; then I gave in and jumped. The water was cool, so one problem was solved. And the weight was gone too. I was just about to feel happy about my situation when the instructor told me to wear the goggles and start breathing using the mouthpiece. Swallow, again. But then the three happy kids started egging me on (or that’s what they thought they were doing), so I put the abominable mouthpiece into my mouse, and I swallowed, again. Well, this time, the swallowing was protocol. That was how I was supposed to breathe. 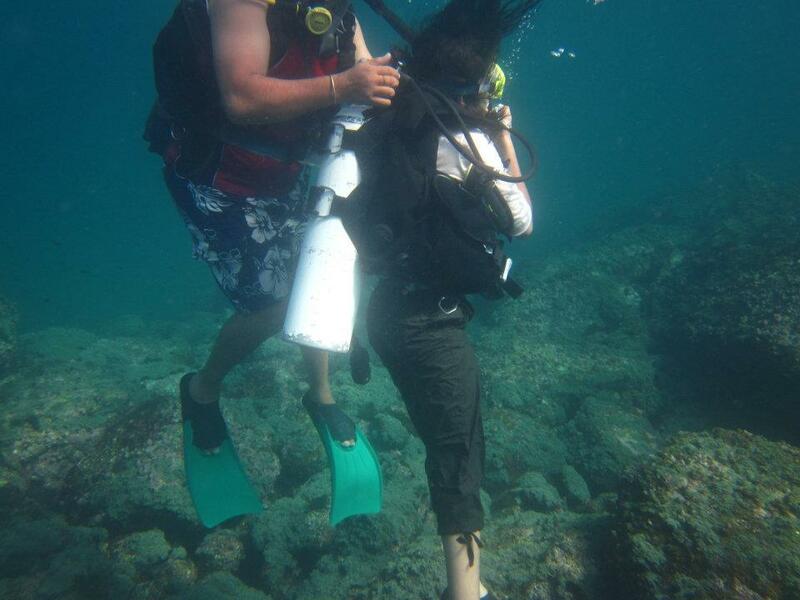 And that felt easy enough, until the instructor told me to do that underwater. Underwater – well, that was what we were there for. Reluctantly, I reminded him, I cannot swim. It’s OK, he said, he is there for me. I wanted to say that I didn’t trust him, but instead, I swallowed and thrust my head underwater. 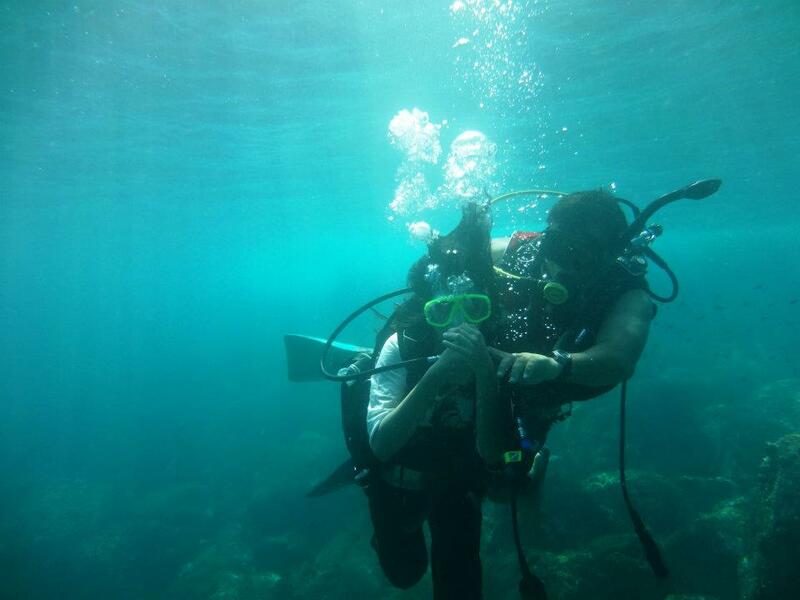 We practised breathing under water for some time, then he deflated my life jacket a bit and we descended downward. Suddenly, I felt a lot of things changing around me. The first change was the silence. No, not the deathly awkward silence, but a lively, comfortable silence that simply belonged there. The second thing was the colours. Suddenly, everything around had become a beautiful shade of blue, the most beautiful blue I had seen. 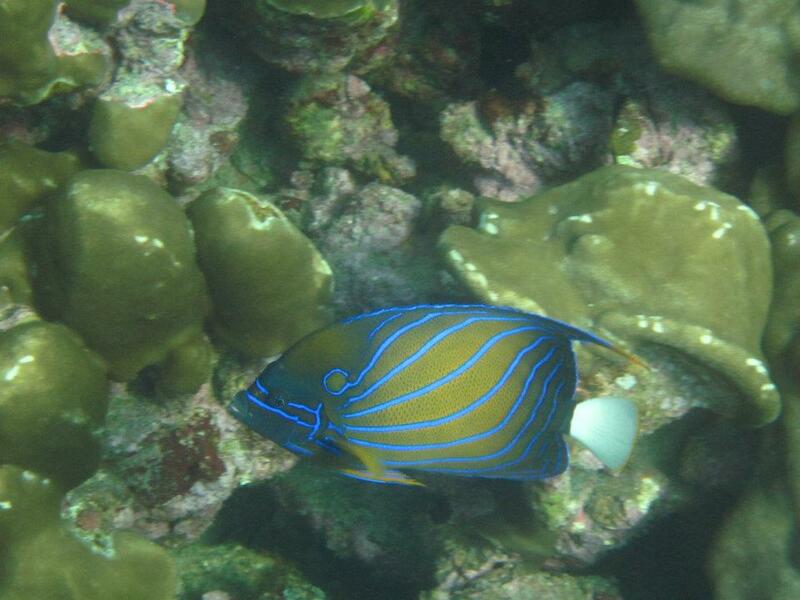 And this beautiful blue of the Sea was teeming with a lot of even more colourful life forms. It was almost as if we had developed the ability of seeing more colours underwater. And the third was distance. All distances seemed magnified underwater. Refractive Index, I mused. I could go to any extent to feel comfortable there you see, and the concept of refractive indices seemed familiar and comforting for some reason – which brings me to the fourth change I had felt. I felt uncomfortable, very uncomfortable. I felt pain in my ears, which was to be expected and which was why I was supposed to equalise. Equalising required me to balance the pressures in my lungs and sinus with the water pressure outside. We fail to realise how easy our lives are because we breathe the same air that surrounds us on earth. To achieve the same balance underwater you have to breathe in through the mouthpiece and try to release the air through your ears. And you have to keep breathing in all the time. Sounds simple, IS simple, only – I was scared. I looked around for the three happy kids, who were the only people I knew in the vast entirety of the Arabian Sea, and I couldn’t see any of them at that moment. Though I hated them for putting me in the situation, I knew I would feel safer with them around. But the one I had around me was my instructor, who, I must say, was a very good swimmer (despite his heavy set figure and a huge round belly). And at that time, he was telling me, i.e. gesturing to me to equalise. I sighed, then realising that sighing underwater was not a good idea, I swallowed. Luckily, that worked. Slowly, we started going deeper and also started looking around. 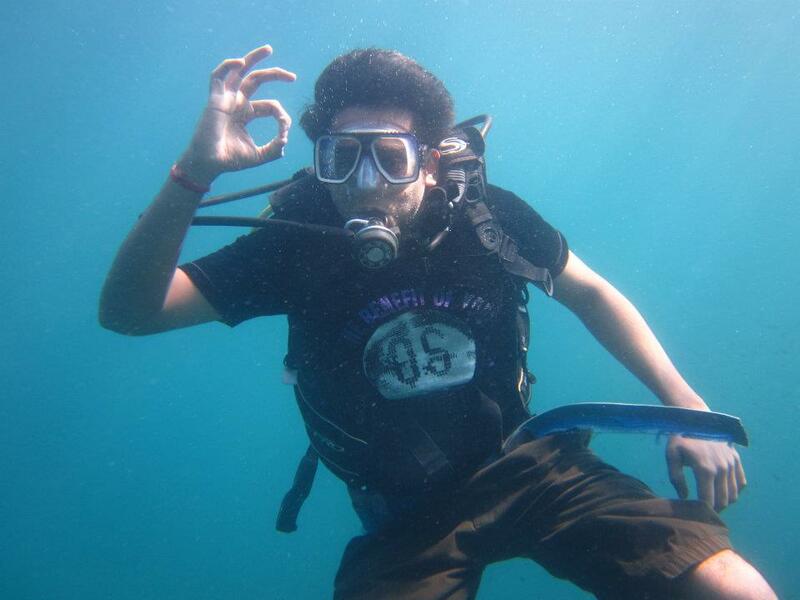 Once I got used to the feeling of being underwater, I realised that the Sea was not a bad place to be. 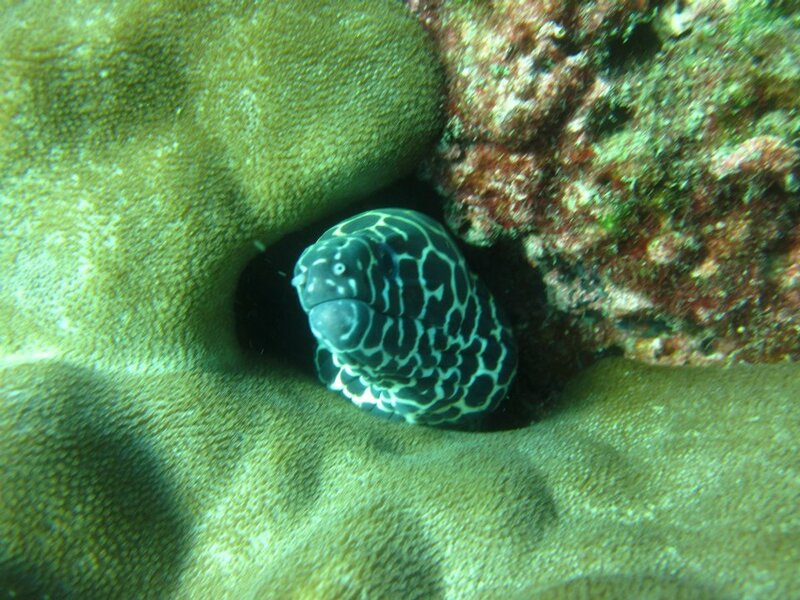 The fish live an uneventfully peaceful life, with nothing to worry them apart from the bigger fish. They keep moving around in the water looking for food, dancing all the while with beautiful graceful movements. Looking at them makes you feel almost jealous of them, you being human and having to struggle so much for a living. After some time, the instructor started showing me the plants and the fungi. And I hated them! Well, in reality I was scared of them and that’s why I hated them. OK, I am not scared of EVERYTHING, believe me – but I am mortally afraid of moving things like earthworms, leaches and centipedes, which have a trecherously soft hairless body and fine attachments that move. And all those fungi and corals looked just like that – soft with fine hair like attachments.So I held myself close, scared of touching or brushing against any of the rocks, and allowed the instructor to navigate through them. in the Sea. Didn’t I want to go deeper? Of course I wanted to go deeper! The maximum allowed was 12 metres, and I was sure all the three happy kids were already there. I had to reach 10 metres at least! Resigned, I allowed the instructor to hold me and carry me deeper into the sea. This time, he knew fully well what I didn’t want. So he took me to the beautifullest place he could find underwater. It had no plants and very little fishes – it was completely barren. But I was completely enchanted. Everything had come to a standstill there, I could sit there in peace and just enjoy the tranquility for ages. The entire sea floor was covered with sea shells of all sorts of shapes and size. It was vast, wide and open – as open as it could be under the water. It looked almost like a playground, and for once, I really wanted to romp and play there! I conveyed my appreciation to the instructor and asked him if he could pick a few shells for me. It was against the rules, but seeing me happy for the first time in the past hour, he obliged. We could have spent more time there, but my oxygen cylinder was almost empty, and we needed to go back up safely. Slowly, we began ascending. On the way up, we caught up with the happy kids and took a lot of pictures. And then, when all the cylinders were empty, we went back to the water surface. We spent some time just lazing in the sea without all the SCUBA gear. Later, when it was late, we left for Murudeshwar. I might have complained a lot, but SCUBA diving was a life altering experience for me. I realised that when I woke up the next day morning and was surprised to find myself wishing I was underwater. The peace and feeling of weightlessness haunted me, and breathing with the nose suddenly felt like too much of an effort. While idling at the beach, I felt that the water surface, even at its best during sunrise and sunset times, was nothing compared to what laid beneath. I knew, at that moment, that I would always remember this one hour spent underwater everytime I looked at a waterbody in my life. 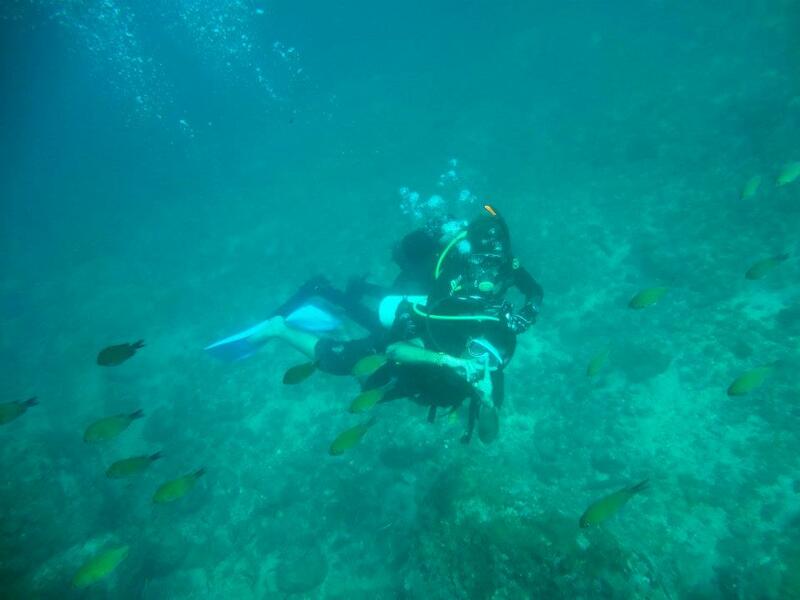 SCUBA diving, finally, had grown on me. P.S. There are no photos of the barren landscape, we had given our camera to another team before we went there.